Bertolli Meal Soup for Two Coupon | Save $1/1 + a Giveaway! 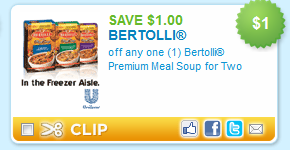 Print a $1/1 Bertolli Meal Soups for 2 Coupon here, available while supplies last. I am also giving away a Bertolli Prize Pack that includes coupons for FREE Bertolli Meal Soup, a cast iron soup pot and an All Clad Ladle – it is an awesome prize! Be sure to enter to win before 3 PM EST tomorrow (Tuesday, 11/29/11). I would like to try all of them!! The chicken florentine looks yummy! I love hot soup in the winter. Hope to win!!! I have been wnting to try these soups! !